Been playing with the new iPad, and was having fun with this painting app Inspire and the photo effects app Pixlr-o-matic. Inspire is quite easy to use, and I really like how the colors can be blended together beautifully. However, the canvas size is too small for the free version, and the image looks kinda blur when you view it on the computer. Pixlr-o-matic is gotta be one of my favorites. It provides many filters that could drastically change the mood of your photos. I found it equally useful for drawings and paintings. 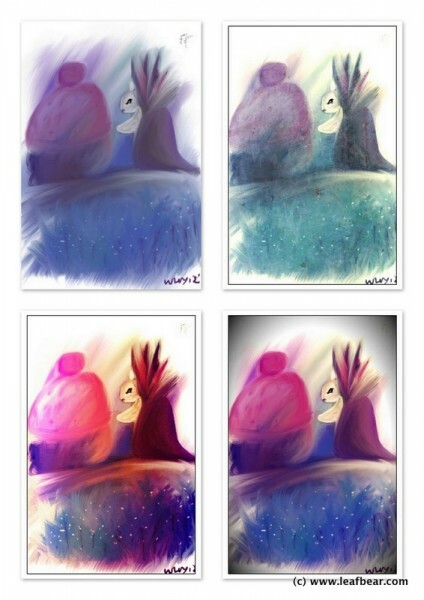 In this Rabbit King painting, the one at the upper left corner is the original one painted with Inspire using fingers, and the rest are different versions of the same painting created by Pixlr-o-matic.